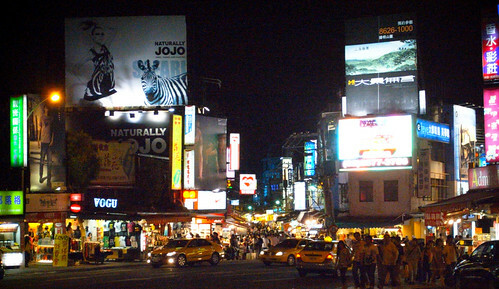 Time for the first installment of Eat, Snap, Repeat Around the World in Taiwan! 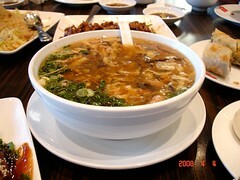 Vancouver has no shortage of Taiwanese cuisine restaurants, and a few popular players have been covered by ESR in the past. The food served at these establishments are a reasonable subset of restaurant food in Taiwan, and gives us Vancouverites a window into what food in Taiwan might be like. 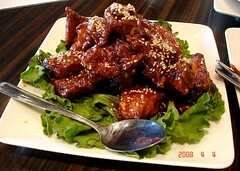 But what is Taiwanese food really like? By that I mean if I was living in Taiwan, what would I be picking up on my way home for dinner, or share with friends on a summer night after a movie? Those questions were answered on my recent trip to Taipei. 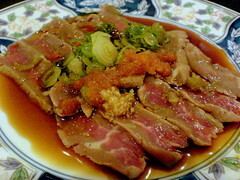 In this first post on Taiwan, we’ll look at one of the best known food spots, 士林夜市 Shi Lin Night Market. Being the size of Vancouver Island, but with a highly developed rapid transit system similar to Japan, just about anywhere in the capital city of Taiwan is reachable in 15 minutes. 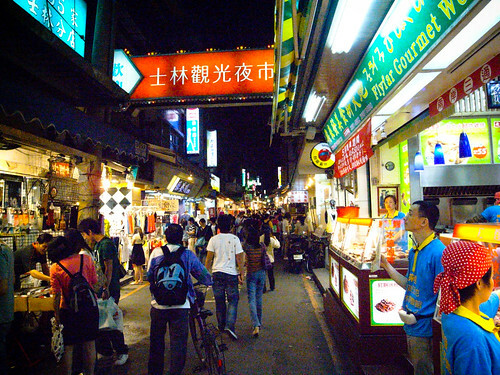 The Shi Lin night market is located right outside one MRT station, and within a 5 minute walk of another. The market itself is not enclosed in a marked area, and spills into the alleyways of several street blocks. Stalls of food, drinks, clothing, trinkets, are intermixed into a huge jacuzzi for your senses. When you don’t have the time or pocket change to go out for a restaurant prepared meal, there’s always the option of eating dehydrated rations out of a styrofoam cup. If you feel guilty about not consuming any of the 4 basic foods during a meal, don’t be. Over 5 billion servings of instant noodles are eaten each year by Japan alone. That’s 40 per person, or 1/10 of a package a day. The Japanese are a perfectly healthy group of people, so there’s really nothing to worry about if you have one once in a while. Nissin has been making instant ramen under the Cup Noodle label for 50 years, and was in fact the inventors of the noodle and cup package. There’s an incredible variety of flavors for cup noodles, but unfortunately here in Canada we don’t get to see very many of them. 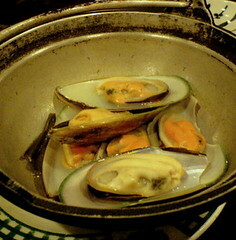 This particular Seafood variation (only available in China/HK) is found in T&T supermarkets in Richmond, and usually when you do find it on the shelf, there’s only a handful of the regular sized cups left. 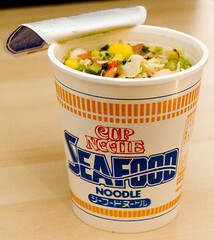 For $1.79, you get a cup chock full of noodles and flavoring bits, enough for an afternoon snack. The yellow ball bits you see in the picture seems to explode MSG into your mouth (that’s a good thing). I could not slurp the soup due to its saltiness, and had to water it down with more water after eating some of the noodles, which are cooked al dente after only 3 minutes. Other than having to refill the water again to enjoy the soup, this has got to be the best instant ramen I’ve ever had. You pay a premium over the other brands, but you’re rewarded with an unostentatious, superior cup of noodle. Anyone else have a favorite noodle they’d gladly use as meal replacement? It was a gorgeous day in Vancouver today, and lunch just had to be eaten outside. Since I’m too lazy to clean off my grill to make a burger, we headed down to the yee olde town of Steveston for a stroll by the water and a quick bite. 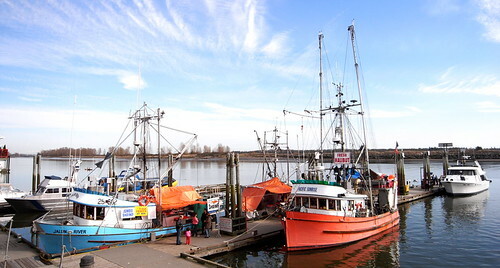 Steveston (formally called Historic Steveston Village) is located at the south west corner of Richmond, by the water. 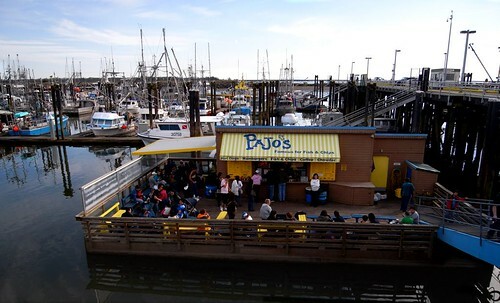 There’s about a dozen restaurants at the fisherman’s wharf lined up along the boardwalk. In the 6 blocks of land of the little town you’ll find the highest concentration of Fish & Chip places in all of Vancouver. I counted about 10 establishments with the word Fish somewhere in their billboard. 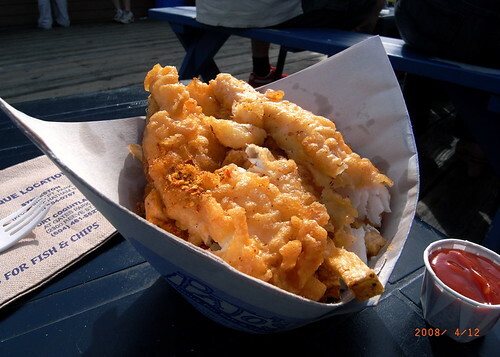 Pajo’s serves a few different variations of Fish & Chips, with different pricing options depending on the type of fish. There are burgers and side dishes available also, but the sign reads ‘famous for fish & chips’, so I wouldn’t pass up the opportunity. We had the small order of Halibut and chips, which came wrapped in a newsprint cone that fits into a slot in the tables nearby. There’s also a good variety of self serve condiments by the window to go with your order. Sitting down in the sun around the smiling young and old made the fresh and delicious meal all the more enjoyable. Dinesty. A name so corny I had a hard time coming up with a serious title. A few came to mind however. 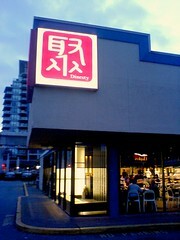 Located on No.3 Road near Chapters, Dinesty surprisingly doesn’t have the lineups the other restaurants have on a Friday night. The interior feels amazingly spacious due to two sides of the wall being full length windows, and a large open kitchen, a feature I love since it ostensibly enhances the dining experience by involving you in the preparation process. Menu items are competitively priced. 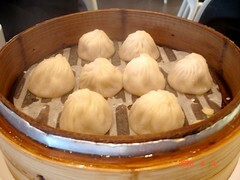 Their specialty seems to be steamed buns. 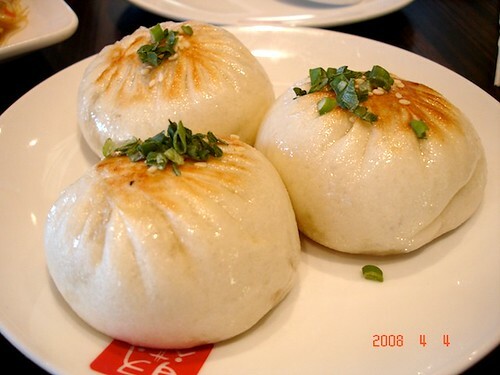 Its like the bubba gump shrimp of steamed buns. Pork buns, chive buns, juicy buns, beef buns, fried buns, buns on a stick, buns of steel, etc. True to their reputation, the buns are pretty good. Other dishes, I’m going to skip the literal translations. 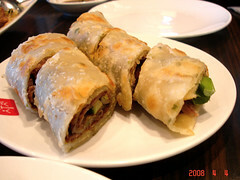 The words bun, spicy, sour, roast beef crepe roll, sweet and sour spare rib can be applied where you see fit. Let your eyes guide you. 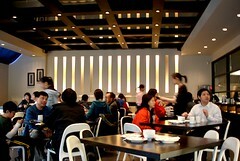 With 5 dishes and one soup coming to ~$52 with tips, I’d try it again just to sit closer to the kitchen. Now how can I end this post without some Eat, Snap, Repeat trivia? I can’t. The last dynasty of China was the Qing dynasty, running from 1644 – 1912. One of the best movies of all time from director Bernardo Bertelluci, The Last Emperor, poinantly illustrated the life of Puyi, the last emperor of China, and was awarded Oscars award for almost every category including best music score, which was composed by the dynamic and talented Ryuichi Sakamoto, a one time member of Yellow Magic Orchestra, who recently starred in a mesmerizing Kirin beer commercial featuring their techno pop song Rydeen. Draft Beer would’ve been great with this meal. Meanwhile as you look over at the open kitchen and see an assembly line of young buckling sushi chefs rolling away like they were making doves out of clay, a lineup at the door extending to the sidewalk, and slowly it all begins to make sense. 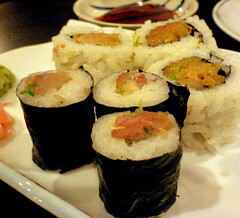 Venture a bit further down, and you’ll find Isami Sushi, a quaint little place with a distinct Japanese feel, and the staff is actually Japanese. In case you couldn’t tell, or just weren’t paying attention, the ratio of restaurants serving Japanese food to restaurants serving Japanese food owned by Japanese people in Vancouver has grown to 1024 to 1 this year. True fact. 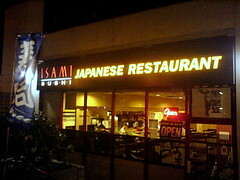 Highly rated and low on the lineups, we gave Isami’s menu a spin with great pleasure. We sampled a few of their sushi items, which were skillfully prepared, along with an appetizer of beef tataki and steamed mussels in some rice wine broth. 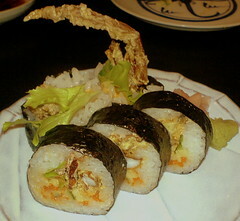 Their dynamite roll was Dy-Na-Mite, and their spider roll had a huge crab leg sticking out and gave that roll more “spider” than it knows what to do with. These guys don’t serve up big portions, but i figure its the opportunity cost in man hours used in rolling the goods that warrants the price of admission rather than the size of the generic frozen atlantic salmon being rolled. The place is adequately staffed with a 4 person wait staff to take your order with attentiveness, and 2 senior looking sushi chefs at the helm. After 6 menu items, the bill came to less than $40, and we left full but not stuffed, and completely satisfied with the dining experience. All true. I swear it.